Mario Draghi at the European Central Bank (ECB) has moved as expected to try to force the Euroland into an economic recovery by cutting a key interest rate on the overnight deposit rate was cut from -0.2% to -0.3%, to compel banks to lend instead of parking money at the ECB. He also extended his ECB stimulus program of monthly purchases of €60bn worth of debt extending it by six months to March 2017. However, Draghi left its main interest rate on hold at a record low of 0.05%. 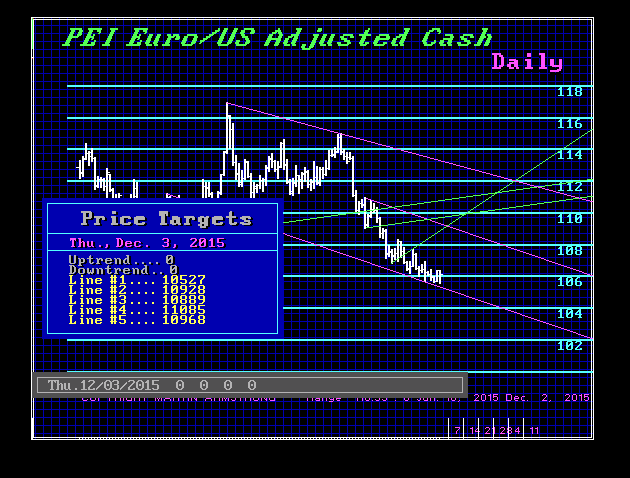 The Euro has rallied sharply as typical when you sell the rumor but buy the news. Many were expecting tougher measures so they were disappointed and covered their shorts. The turning points were the 2nd and then Monday 7th. The intraday low was on the 2nd so a closing above 10817 today will allow this to retest the 11140-11200 level. The intraday low has been about 10549 and our key numbers for year-end are the 10365 and 10530 levels. A closing ABOVE 10530 will warn that the trend could extend into the 2017 time period whereas a closing for 2015 below 10365 will open the door to a collapse in 2016. The key on a weekly level will be the 11098 for the close tomorrow. To show any strength that might be sustainable will require a closing above that level for the week. A closing below 10830 tomorrow will warn that this will not hold on to the gains so easily.